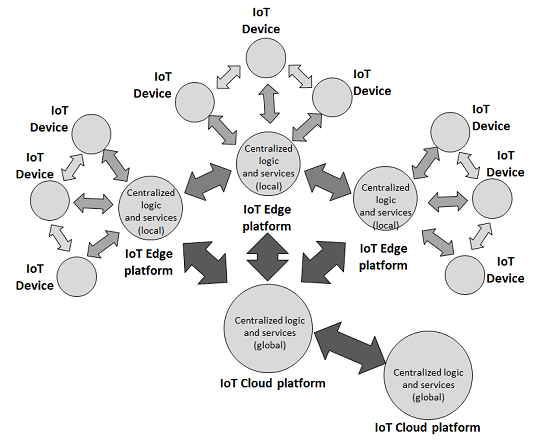 With the advent of IoT, the Internet has moved to a model where devices connect to other devices, applications or services, in order to implement new types of applications and business processes. However, most of the devices currently used as part of IoT solutions have rather limited capabilities, seeking a balance between price, performance and power consumption. 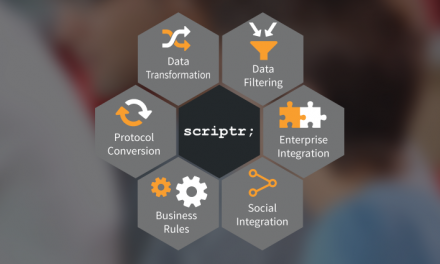 As a consequence, the main part of the – computing intensive – logic that defines IoT applications is implemented and executed today on IoT cloud-based platforms, such as scriptr.io, which provide the required software and hardware infrastructure. On another hand, Moore’s law and market studies predict that the price of connected devices will continuously drop whereas their performance will proportionally rise. In parallel, computing on the Edge – also called Fog Computing, a term coined by CISCO – fosters the availability of computing capabilities and services at the edge of the networks. Moving computing and services at the edge is expected to offload cloud platforms, prevent unnecessary bandwidth use, and free real-time applications from being subdued to network latency. Drawing from the preceding points, it makes sense to think that in the near future, part of (but not all) the processes that are currently running on IoT cloud platforms will be moved back to “smarter” devices. This will result in a shift from a centralized, orchestration-only model, to a distributed and multi-agents model, with less centralized orchestration and more collaboration among devices, platforms and third party services, making the vision of building the IoT by assembling smart objects a plausible reality. The device level, that contains parts of a larger application, run by devices. Enabling cooperation based on this model requires the availability of a middleware to provide service lookup, security, communication, interoperability, orchestration and location transparency. Location transparency is complementary to service lookup and means that the details of accessing services should be kept as transparent as possible to the applications and other services that are running on a given layer. A provisioning service for adding new nodes on top of our infrastructure and automatically deploy/update our agents on the corresponding nodes. A provisioning service that receives application updates and deploys them on the device. A cloud node is responsible for the provisioning of edge nodes and is used as an authentication referent and service directory to all edge nodes (and possibly standalone device nodes). Recursively, an edge node is responsible for provisioning devices and is used as an authentication referent and service directory to all its device nodes. In the below we give a simple example to illustrate how to enable collaboration using our prototype. 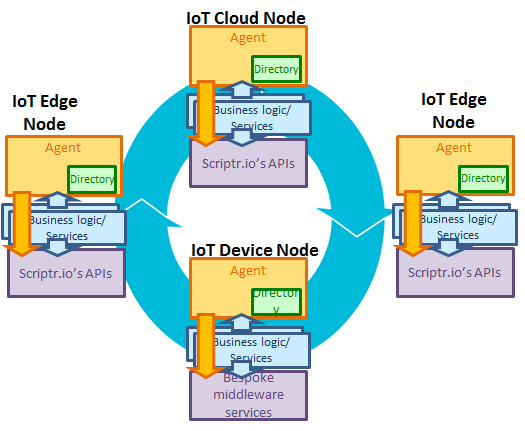 Our example uses two scriptr.io edge nodes (E1 and E2) that refer to the same scriptr.io cloud node (C). Node E1 hosts an account in which we deployed our Nest connector and exposed its “setTemperature” method as an API. The account also contains a simple script that register the API as a service in the service directory, using the edge agent. For now, our prototype imposes saving the above script as “temp_control/api/setTemperature”. return agent.registerToDirectory("temp_control"); // register the service as "temp_control"
return agent.callService(dto); // invoke the remote API using the agent's callService method.